So how do you do it? First, we recommend you watch a video tutorial that Holly Bik prepared to walk you through how to use Phinch. Then, you’ll download the specially formatted datasets to your desktop — the files, one for bacteria and archaea and another for fungi, contain information about the species detected, locations in the home where we found the species and some data about the homes where we found those species. Next, go to hip-hop Phinch (be sure to open it in Google Chrome) and browse for the file you have downloaded. Once you have found it, upload it. Then the fun begins. You can begin to explore the data in its full fullness. Data visualization is a critical component of research in many ways these days. But I think it is extra critical for citizen science projects on “microbiomes” because, well, the data is a bit complex and, well, people don’t see the actual microbes in most studies. 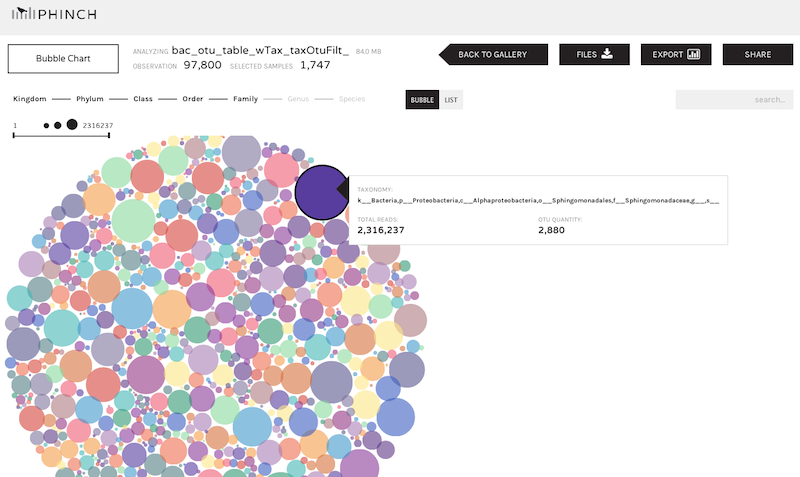 So I hope people try this out and find it useful and help continue the development of data viz tools for microbiome work.